Stu-Pots in the Market Place is packed with every imaginable household item to help with every task and need from cleaning and maintenance to cooking and dining. Far from being fashionably minimalist, the purpose of this shop is to stock every household item one might possibly need for any situation. The 6th of June 2018, will mark the shop’s 25th anniversary. Stu-Pots is run by Stuart Blow and his assistants Naomi and Tina, who have been working at the shop for 23 and 14 years respectively. 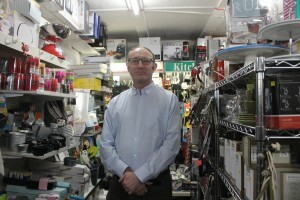 Mr Blow, originally from Lincolnshire, bought Upton’s shop at the corner of the Market Place and New Street 25 years ago. After trading there for a few years, they needed more retail space and moved to their current premises. With items for the professional chef and the cooking novice, it is possible to wander through the crowded aisles for hours. The shop promises a journey of discovery, particularly to new home owners who make a bee-line to Stu-Pots when they move to town. Trade accounts with local farmers are also maintained, and the changing seasons are reflected in what gets sold. For example, during the hunting season, popular items include flasks, sloe gin supplies and baking equipment for shoot lunches. The stock on offer is wide and varied, from top-quality knives and cookware to ironmongery, dustpans, brushes and picture hooks. As a small independent shop, Stu-Pots has the flexibility to stock what they want, when they want it. “If someone wants an asparagus steamer, we can stock it!” Tina said. Wandering through the narrow passages, past shelves with teetering heaps of high quality pots and pans of every shape and size, it is only natural to feel a bit lost, especially if you are a first-timer. But if you feel at all confused about where to begin, Mr Blow will know exactly where to find what you need. The shop assistants also know where to go. Their personal service is something that cannot be replicated at a large chain store.